Q: What is the best way to build strength in a short period of time? -Use a Pyramid set rep scheme from light weight and high reps, to a low rep/heavier weights: 6 sets of 12-10-8-6-6-4 reps. Increase weight of at least 10 lbs per set. Q: For someone looking to bulk up but look lean, what is your advice? Q: What is the supplements that someone should be taking if they want a great physique but prioritize health? -Hmm Use Synergen3 sports supplement it’s safe yet very effective for building muscle and burning fat. Q: What is a diet someone should stick to on a daily basis? -Mediterranean Diet works great. Dr. Sears created the 40-30-30 diet based on the Mediterranean Diet works great on a long term basis for health and manage your body weight. Q: When can someone stray from a diet but still achieve max results? -Cheat days are ok, usually a cheat day once a week is allowed without negative weight gain. Q: Do you believe in cardiovascular health and what is the best way for the average person to achieve that? Q: How does someone get motivated for getting into shape and sustaining that level of fitness they truly desire? -Getting motivated is the key in getting started, finding a partner is a great tool. Secondly, a well designed exercise program is also encouraging because a well designed plan gives someone more hope in making progress. Progress created on a week to week basis keeps someone motivated! Q: What are some quick steps someone can do it they have been wanting to get in shape but haven’t been able to stick to something long term? -By setting short term goals weekly time frame. Within a few weeks you will make progress therefore motivating you to be more consistent. Q: Do you think the pendulum of the fitness world swings too far when looking up to fitness models and bodybuilders with single digit body fat numbers, setting people up for disappointment? How realistic is a level of physique that really captures attention like a fitness model on a cover of a magazine or an actor in a movie? -Yes the pendulum does swing to far instead we should see more-testimonials of people making progress based on real life struggles. High level Physique development for most people is very Unrealistic. These individuals typically have just completed being in contest shape and will not even hold this level of shape for no more than a few weeks. I know this first hand, because I compete as a natural bodybuilder and work as a fitness model. Ramsey has been a Natural Competitive Bodybuilder for over 30 years. Ramsey has competed in the Natural Olympia Top 5 finisher. Ramsey is a Certified Nutritionists w/ International Society of Sports Nutrition and Certified Strength/Conditioning Coach w/ National Strength/Conditioning Association. Ramsey is a Sports Trainer and has worked w/ National level athletes sports of Track/Field, Football, Basketball, Baseball and worked with many Bodybuilders and Powerlifters. The inspiration for Synergen3 began with working with World Renown Coach Dr. Angel Spassov formerly of University Texas Strength Coach. Coach Spassov is a pioneer in the development for Sports Trainning and worked w/ the Russians in the late 1960’s in the advanced development of Periodization Training. 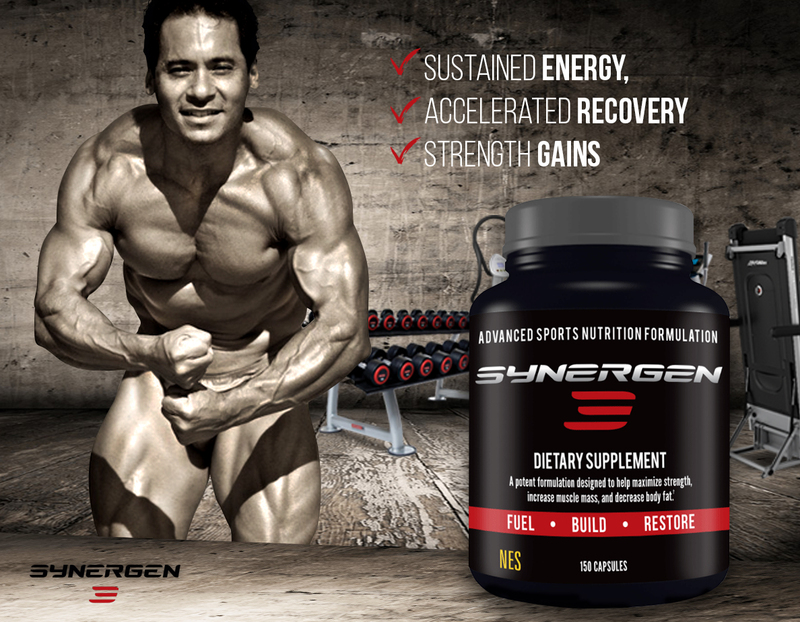 Ramsey background/experience in the Nutrition/Sports Supplement Industry along w/ Dr. Spassov expertise together created Synergen3 the most advanced sports supplement for building strength, muscle and reducing body fat!